Annapolis is home to two four-year colleges that are as different as night and day. They are alike in that both of them are located in downtown Annapolis. Beyond that, the similarities between the U.S. Naval Academy and St. John’s College are harder to find. With the 31st Annual St. John’s College versus U.S. Naval Academy Croquet Match just around the corner, many people still wonder how the unlikely face-off first came to be. St. John’s is the third oldest college in the nation. It’s a direct descendant of King William’s School, founded in 1696. In 1784, the State of Maryland purchased the then unfinished governor’s mansion along with its surrounding four acres as the site for a new re-chartered school, which they named St. John’s College. Today, the College’s Annapolis campus covers approximately 32 acres. Four of its founders were Maryland’s signers of the Declaration of Independence: William Paca, Charles Carroll of Carrollton, Thomas Stone, and Samuel Chase. Both institutions of higher learning offer four-year degrees. The Naval Academy’s 4,500 midshipmen follow an academic program that begins with a core curriculum that includes courses in engineering, science, mathematics, humanities, and social science. The goal is to offer a broad based education that qualifies Naval Academy graduates for nearly any career field within the Navy and Marine Corps. Midshipmen graduate with a Bachelor of Science degree. St. John’s offers an integrated liberal arts and sciences program based on reading and discussing the great works from Western thought. It is a textbook-free institution. Instead, its 450 students garner their information from original sources and discuss them in seminar-style classes. The goal is to learn skills of critical analysis and cooperative inquiry. Rather than taking tests, the “Johnnies” write annual essays which they defend in oral examinations. St. John’s students graduate with a Bachelor of Arts degree in liberal arts. While many differences exist between the two institutions, the students at both schools are united in their common desire to defeat one another in the annual St. John’s versus U.S. Naval Academy Croquet Match. In what is arguably the largest croquet event in the nation, the Johnnies and the Mids compete each spring for the coveted Annapolis Cup. The Johnnies play in uniforms ranging from camouflage khakis, to Vikings’ attire, to bare feet. The uniforms change each year and are kept secret until the match begins. The Mids follow the U.S. Croquet Association’s code, wearing white shirts, pants, sweaters, and shoes. The only part of their uniform that changes from year to year is the color of their ties. Tradition has it that the rivalry began in 1982 when the Naval Academy Commandant told a St. John’s freshman the midshipmen could beat the Johnnies in any sport. The freshman replied, “What about croquet?” Thus began the annual competition. Since that time, St. John’s has won the Annapolis Cup in 25 out of the 30 matches. Who will win the 31st annual event? Come see for yourself. 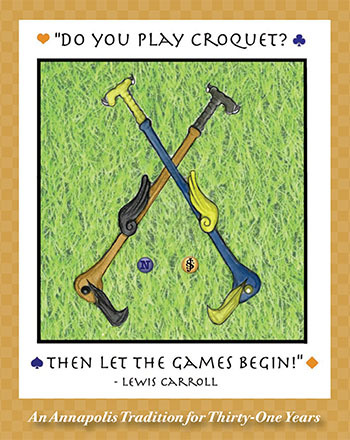 The Croquet Match is slated for Saturday, April 20, at 1:00 p.m. on the lawn of St. John’s College. You’ll know you’ve arrived when you see a host of lavish feasts and Great Gatsby-attired guests and hear the Naval Academy band. Bring a picnic lunch and be sure to come early to stake out your favorite spot. You won’t want to miss a minute of the action – or the fun! The Rain date for the event is Sunday, April 21, at 1:00 p.m.